Surrounded by a gaggle of reporters and government officials on top of a parking deck overlooking the former Baptist Hospital site in South Knoxville, Gov. Bill Haslam last week confirmed rumors that have been swirling around town since early October: Regal Entertainment Group, the country’s largest theater chain, will relocate its corporate headquarters from Halls to the South Waterfront in a deal heavily financed by taxpayers’ dollars. Two activists briefly interrupted Haslam early in his speech, screaming “Tennessee is not for sale” multiple times before quickly being ushered away by security. #TNisnotforsale has been a battle cry and hashtag for opponents to the governor’s plans to potentially outsource thousands of state jobs to private companies. 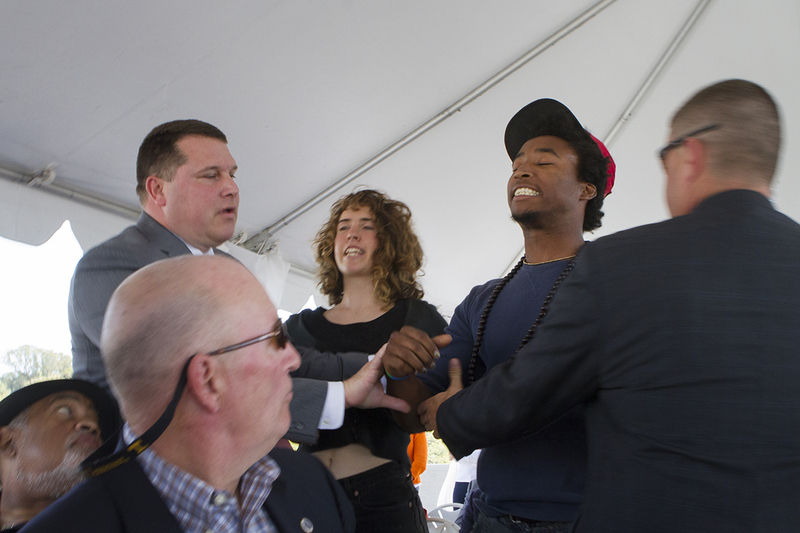 Two protestors interrupt Gov. 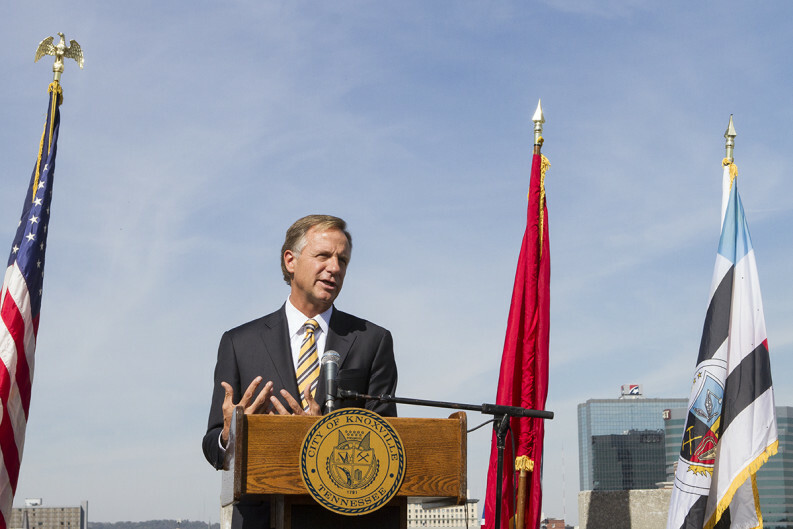 Bill Haslam during Friday's press conference. Photo by Clay Duda. Knoxville Mayor Madeline Rogero said Regal was “being courted” by other municipalities around the country as it looks to move and possibly expand its corporate headquarters, which currently employs about 325 people in a small unincorporated area about 10 miles north of Knoxville. Its move into the nine-story former medical building just east of the Henley Street bridge will give it room to add as many as 70 new employees, though the company has not committed to fully staffing those positions. 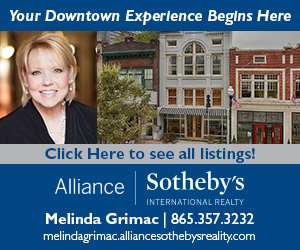 Under the agreement, the city of Knoxville will purchase and renovate the 178,000-square-foot building off East Blount Avenue, contributing a total of $9 million; Knox County is planning to pitch in $1.5 million; the state of Tennessee will provide $1.5 million; the Tennessee Valley Authority will contribute $80,000; and current property owner Southeastern Development Associates will put $500,000 toward exterior improvements, for a total incentives package of $12.5 million. Renovation costs are estimated at $10-11 million. Of the city’s $9 million commitment, $3 million will go towards remodeling work, along with $3.5 million in public funds from the state, county, and TVA. Regal will pay for remaining renovation costs not covered by the incentives package, an estimated $4-$5 million, according to the city. The price total includes all office furniture, fixtures, and needed equipment. “It’ll be great to look out my office and see your logo on this building,” Rogero said to Regal CEO Amy Miles. 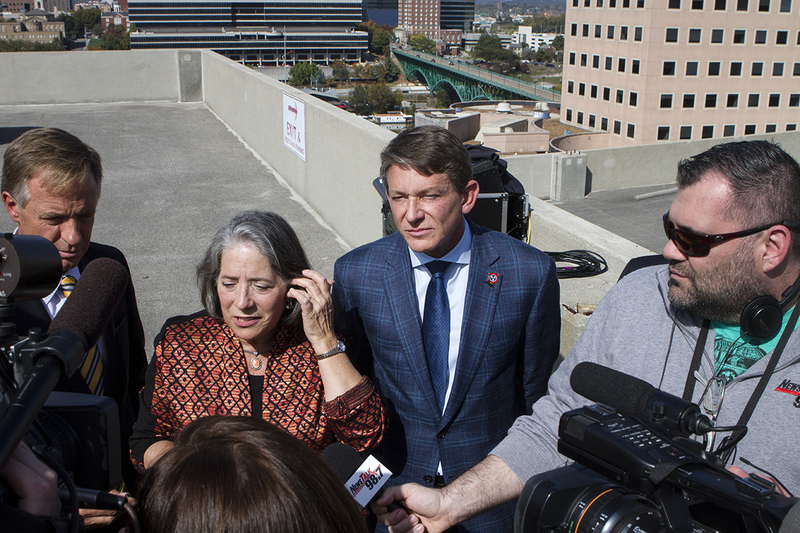 Knoxville Mayor Madeline Rogero, at center, answers questions from the media following Friday's press conference. Photo by Clay Duda. SEDA (formerly Blanchard & Calhoun Commercial, Inc.) bought 23 acres along Knoxville’s South Waterfront, including the building to be Regal’s future home, for $6.25 million in 2013. The city will buy that building for $6 million—near the total SEDA paid for the entire 23-acre swath—as part of this deal, while SEDA will continue construction on the rest of the site, including an adjacent mixed-use development with 300 luxury apartments, 40,000 square feet in retail space, 230,000 square feet of office space, a riverwalk, and an entertainment plaza, and a 225-unit student housing complex west of Henley Street, according to its website. Regal will pay no rent during its initial 10-year lease term, instead making payments equal to the amount the city would collect in property taxes on the improved value of the building. After the first decade, Regal has the option to extend the lease for two more 10-year terms, paying a rent of $1 per square foot for years 11-20, and $2 per square foot years 21-30, if it chooses to stay. The theater giant may buy the building at anytime, city spokesman Jesse Mayshark explains, saying the hope is the city will “be made whole” and not lose money on the deal in the long-run. Regal will be responsible for all building maintenance and repairs while it’s a tenant. The city has signed a letter of intent to see the deal through, though it is still subject to approval from the City Council and the State Funding Board. The Knox County Commission voted unanimously Tuesday to support its $1.5 million piece of the puzzle. Mayshark says approval could come from the city in two parts, the first step involving a budget amendment to free up funding before voting on final approval. It could go before the City Council within two weeks, though it may take longer, he says. 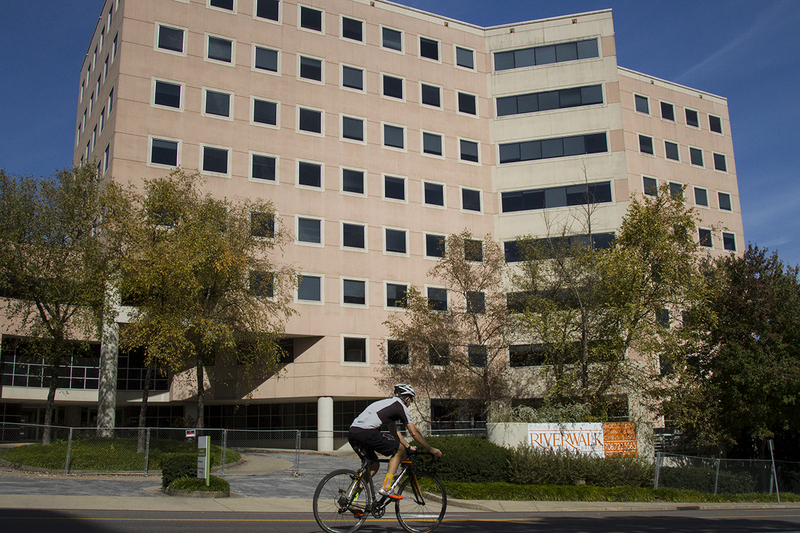 Under terms of an agreement announced Friday, this abandoned office building will soon transform into the new corporate headquarters of Regal Entertainment Group. Photo by Clay Duda. While big news, Friday’s announcement wasn’t exactly unexpected. Knox County Commission earlier that same week approved spending $1.5 million on “economic development on the South Waterfront,” finalizing its support with a unanimous vote on Tuesday, and speculation has been rampant since anonymous sources leaked tentative details of the deal to WBIR reporter Mike Donilla earlier this month. Regal was founded here in Knox County back in 1989 and has since grown to boast 571 theaters in 42 states around the U.S., employing more than 23,000 people nationally. Like most things governmental, this deal is complex. Check out the city’s three-page explainer for some of the nitty gritty terms and clauses.